I decided to go out on a limb and made a cake, a cheesecake to be exact. This is exciting stuff as I’d happily admit that making desserts is not one of my strengths. The combination of my lack of ability to follow a recipe and in general lack of practice of making desserts does not usually equal success. I’d only attempted a cheesecake once before and it was a complete flop! Blindly optimistic, I decided to not only attempt a cheesecake again but to make it a healthier version too. A standard slice of cheesecake can easily contain 25 to 45 grams of fat (of which about 75% is saturated) and anywhere from 1600 to 2800 kilojoules. The below recipe contains only 8 grams of fat and about 1100 kilojoules. And yes, it’s still a standard serve size! Was this cheesecake a complete flop too? Go figure but it worked a treat and I’m absolutely chuffed to share it with you. It is delightfully delicious; equally light and delicious. For the true cheesecake fans, do note that it doesn’t contain a biscuit base so you may feel better if you compare it to perhaps a crème caramel. 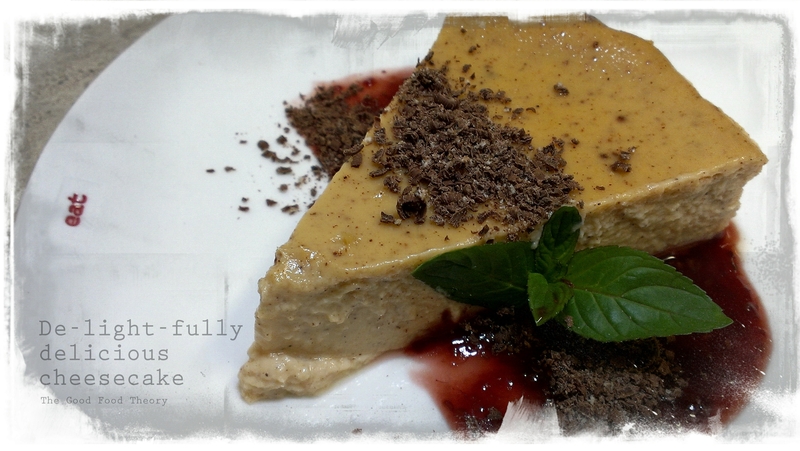 ‘Cheesecake’ is back on the menu at home (sometimes)! Next time, I’ll try to reduce the added sugar content as well!